There's nothing better than an authentic, rustic barrel. They're beautiful on their own, doing the job they were born to do, and even more stunning when given new life in your home or at your party. Plus, whether you consider yourself a wine connoisseur or just a fan of wine, this look has a story in every plank, rivet, and nailhead. If you're not lucky enough to get your hands on the real thing, many craft stores sell beautiful replicas you can easily make your own. 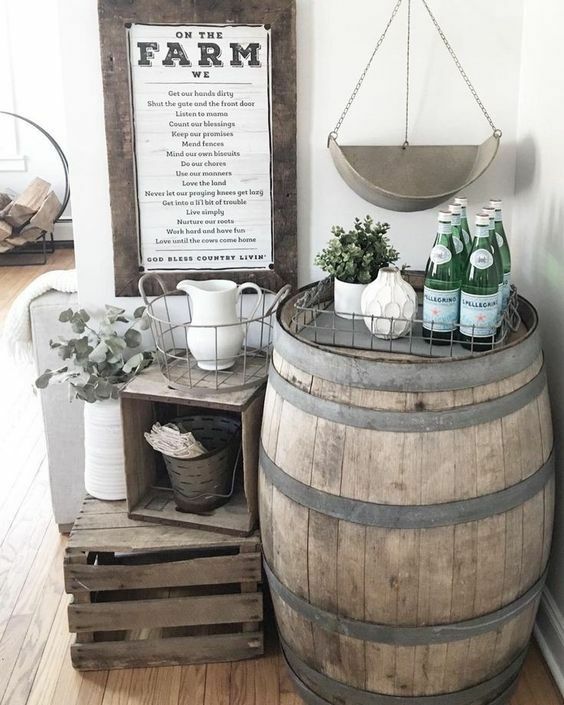 Though you've probably seen wine barrels used at weddings, there are endless ways to bring them into your home as well. 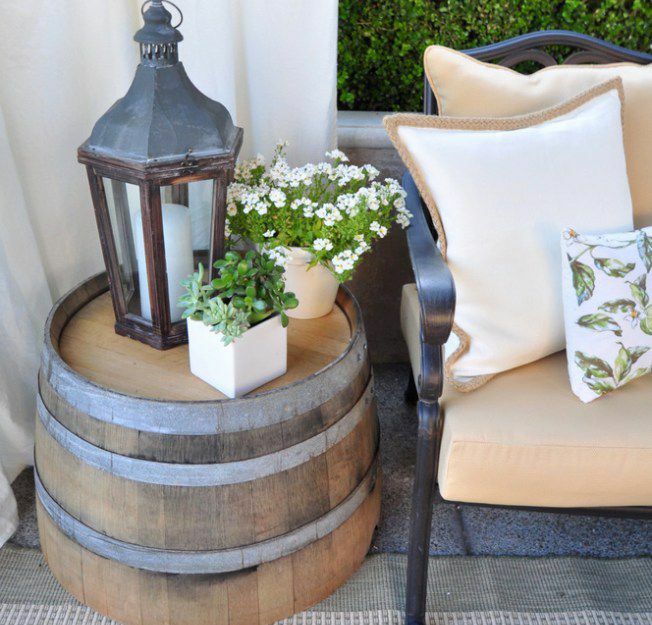 This patio side table from Centsational Style was built by cutting a full-sized barrel down to knee-height, creating the perfect landing pad for a summer lemonade or, of course, a glass of wine. Here, we round up even more barrel looks we love. Who says wine barrels can't be comfortable? Blogger Oliver and Rust created the perfect ottoman out of an old wine barrel using thick foam. She paired this rustic look with patio furniture, but you can easily bring it inside into your living room for some modern farmhouse appeal. If you have an empty corner you've struggled to fill, this barn-inspired vignette from athomewithjackie is great inspiration. This look is for those that like to fill all the negative space in their homes and adds an element of visual interest in the dining space. If this look is too much for you, consider just placing a barrel in a corner as a functional entryway table or key drop. Barrel decor may not be for everyone, but this indoor coffee table from The Rugged Rooster proves you can easily make it your own. In this easy DIY, a wide wooden tabletop is added to provide more surface space, but imagine this look with a piece of marble (real or DIYed) or glass for an even more updated feel. Don't be afraid to experiment if you want to tone down the rustic style for a more modern look. Talk about giving old wood new life. This wonderfully unique adirondack chair made by noblemade.co uses the panes from an aged barrel to create an outdoor look perfect for summer nights. Since this creation may be a bit advanced, we recommend employing the help of a local furniture maker to recreate this fun chair. The top and bottom portions of a wine barrel provide the perfect canvas for beautiful art. Artist rawrestorations created this minimalist color block piece using an old barrel, and we think it would look beautiful in any room in the house. You can find many versions of this on Etsy and beyond, or let your creative juices flow and try painting one yourself. This adorable little bar setup from feelgoodeventsmelbourne is perfect for an outdoor wedding or party, but just imagine it under a covered patio or next to a pool for warm weather entertaining. Add a few hairpin bar stools (as seen here) or create a standing-only bar space and voilà: instant outdoor charm. Calling all dog lovers! This amazing DIY from The Gilded Horn is everything we love about home decor. It's beautiful and useful, giving your pup a cozy and comfortable place to sleep that blends in beautifully with your decor. This industrial-inspired shelf from sheri.norris is a great way to use all the materials of a wine barrel without it looking overly rustic or farmhouse-y. Throw a few bathroom-friendly plants on it to add some greenery, and you'll have the perfect mix of old and new. How beautiful is this succulent barrel planter from fortheloveofsucculent? This is a great way to spruce up your patio or walkway on the cheap. Plus, many hardware or garden stores sell replica versions if you want to skip the DIY labor. Want to incorporate barrels into your decor scheme, but wine barrels are a bit too old-fashioned for your taste? This incredibly chic and industrial side table from gafisa uses an oil barrel instead, and the result is a look straight out of a New York City loft. You can find empty barrel drums on Etsy or eBay - just add paint!